Echoes of Norway: Can you love a stone? I'm back!! We are on our drive back to Norway and are at this very moment in a hotel room in lovely Copenhagen. I could've spend more time with my family in Germany. It was utter delight. We all had so much fun, sat outside in my parents large porch drinking Bailey's until midnight, laughing and joking around. I will talk a bit more about my trip in one of my next blog entries. It is almost 11pm and we are pretty beat from 12 hours of driving. Tomorrow morning we have plans on strolling the local 1 mile "stroget" which is europeans largest shopping street. Hope to visit Topshop and get meself some cool clothes. 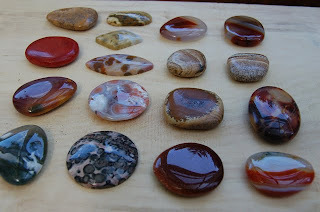 I am attaching some pictures of stones I have purchased while in Germany. I can't even begin to describe how super duper excited I am about them. I got so lucky because my dad used to collect rocks and knows a LOT of great people who cut and polish rocks. We must have visited about 5 different rock shops while I was there. 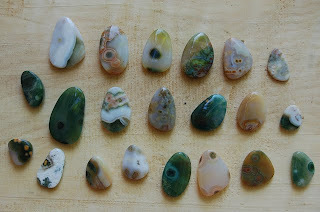 oh my gosh i LOVE the bounty of ocean jasper!!! probably one of my favorite stones...it can come in such a variety of colors and variations. 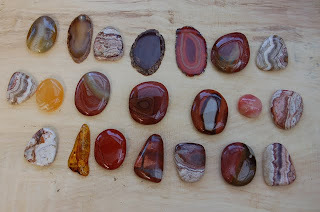 also those agate slices are just scrumptious, i can't wait to see what you create with this selection. 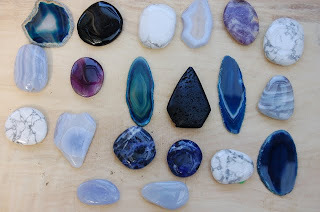 i really relate to your love of stones, everytime you post the oodles of lovelies you find, i drool all over my keyboard at them! Hi there! I have been following your blog for a long time now. First time to leave a note though. Just wanted to say, those are beautiful stones! Keep up the good work!! I'm also a big fan of ocean jasper. I just couldn't resist buying a whole bunch. 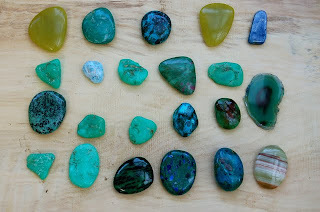 If fact I bought every single ocean jasper cabochon of what this shop had left which wasn't a whole lot. The ocean jasper mine in Madagascar is under water now and there won't be any mining going on now for a long long time.